James Fenimore Cooper was an American author best known for his adventure stories. His most popular work is The Last of the Mohicans. Cooper found success with his second book, The Spy. He became known for stories featuring rugged characters and a frontier way of life in stories such as Natty Bumpo, The Deerslayer, and The Pathfinder. He published over fifty books in his lifetime. The Last of the Mohicans is a novel that takes place during the French and Indian War following the adventures of Nathaniel "Natty" Bumppo and his two Mohican companions as they attempt to rescue the daughters of a British commander. Set during the time of the Mexican War, Jack Tier is a realistic sea story. FCIT. "James Fenimore Cooper author page." Lit2Go ETC. Web. 19 April 2019. <https://etc.usf.edu/lit2go/authors/160/james-fenimore-cooper/>. 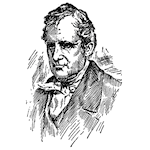 FCIT, "James Fenimore Cooper author page." Accessed April 19, 2019. https://etc.usf.edu/lit2go/authors/160/james-fenimore-cooper/.